Crown Packaging’s Richmond division began in the corrugated industry in the mid 1940’s as a company called Canadian Boxes. Subsequent acquisitions and expansion facilitated construction and relocation to the present site in Richmond, BC. The operation consisted of a full line corrugated plant, with paper bag manufacturing and additional paper printing and converting capabilities. In 1956 this operation was purchased by the Crown Zellerbach Corporation. 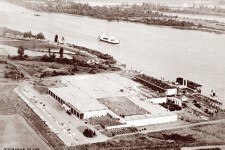 The company changed hands in 1983, when Fletcher Challenge Canada bought the facility along with the other assets changing the name to Crown Forest Industries Ltd.
During 1992 Fletcher Challenge sold the corrugated, bag making and paper converting operation, taking on a new corporate identity as Crown Packaging. In the spring of 2001 the manufacturing facility was sold to Port Townsend Paper Corporation. The Richmond division no longer manufactures paper bags choosing to focus on their core competencies of corrugated carton manufacture, printed paper wraps and wallboard tape.